Cut large potatoes in half as needed to make similar-size pieces. Place carrots in 5- to 6-quart slow cooker. Top with onion and potatoes; sprinkle with 1 teaspoon salt. Add asparagus to cooker. Increase heat setting to High. Cover and cook 15 to 20 minutes or until asparagus is crisp-tender. Mix oil, dill weed, lemon peel, mustard and 1 teaspoon salt in small bowl. Pour over vegetables in cooker; stir to coat. Vegetables will hold on Low heat setting up to 2 hours; stir occasionally. 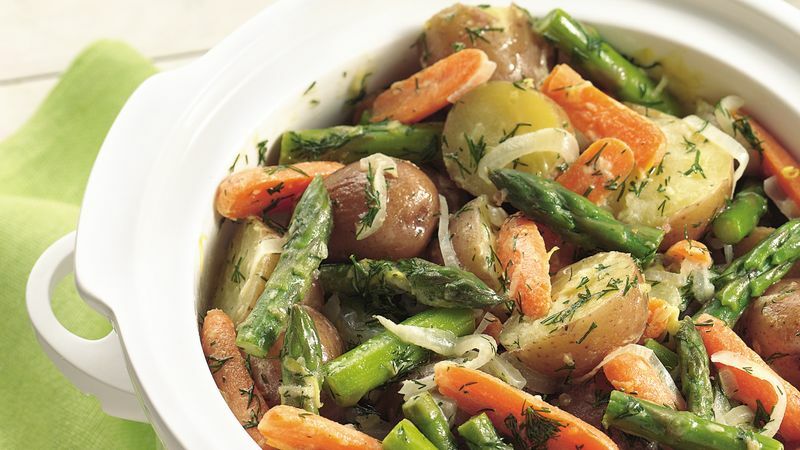 This delicately herbed vegetable dish complements the stronger flavors and textures of dishes including a garlic-spiked turkey breast or London broil beef brisket. Spoon these spring vegetables on a platter or into a serving bowl, then tuck sprigs of fresh dill weed around the edge.